Awesome Susan! I still don't know how you do it. I think you must have either cloned yourself, or have some kind of time-dilation machine. Whahoo! Here's one for you! OH YEAH!!!! i'm almost done with open minds! and now, i'm like DUDE!!!! when does the next one come out!?!?!? *grins* I must admit that having people asking for the second book lights a serious fire under me to get it done! Now that the second draft is done on time (according to my schedule), I’m feeling more confident about that May release date. I’m glad you’re enjoying the book! Wow–congrats! 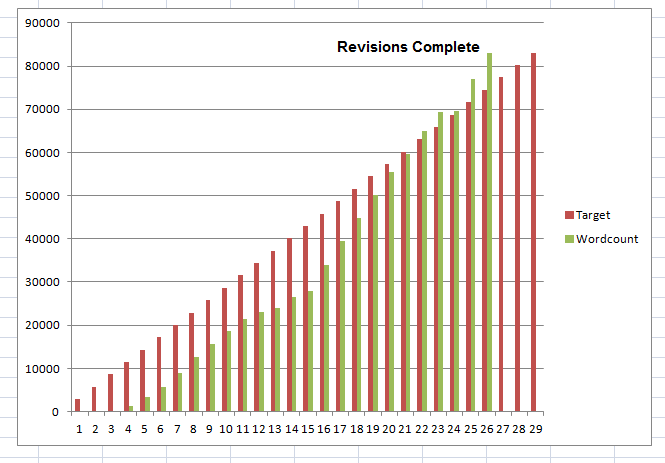 I always found visual aids like this to be incredibly motivating with my writing. Now someone pour this lady a drink! Congrats! I haven't written with these types of goals before, but I think I could really do well with it since I'm a numbers type of girl. Thanks for sharing! Numbers are so much easier to wrestle onto the page so they make sense. Either they're right or they're wrong. Love that, especially after trying to get words to express what I want. Yay! I loved Open Minds! I can not wait to read the next one. Congrats! Way to work – inspirational for sure. I've got ice in the cocktail shaker and olives in the glass. Do you prefer vodka or gin? Congrats, Susan! I'm trying to get my draft #3's done and out this month. That is a beautiful, beautiful chart. I need a coffee consumption chart, to make sure I properly reach my daily caffeine requirements. Congrats, Susan, we knew you could do it! Charts are great for analytical types (including me). They have a logical beauty. And I'm with Bryan – I require a certain amount of coffee on a daily basis, too. Hot tea comes in second. Yay! Well done, Susan. I can't wait to read it! Ah, the power of the graph. Congrats.